Our Orange Crush Soda Cupcakes with Orange Crush Soda Buttercream frosting are absolutely loaded with orange flavor and so delicious! 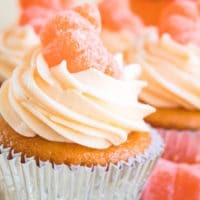 These delightfully fruity Orange Crush Soda Cupcakes with Orange Crush Soda Buttercream Frosting are made from scratch and packed with citrus flavor in every bite of the cupcakes! 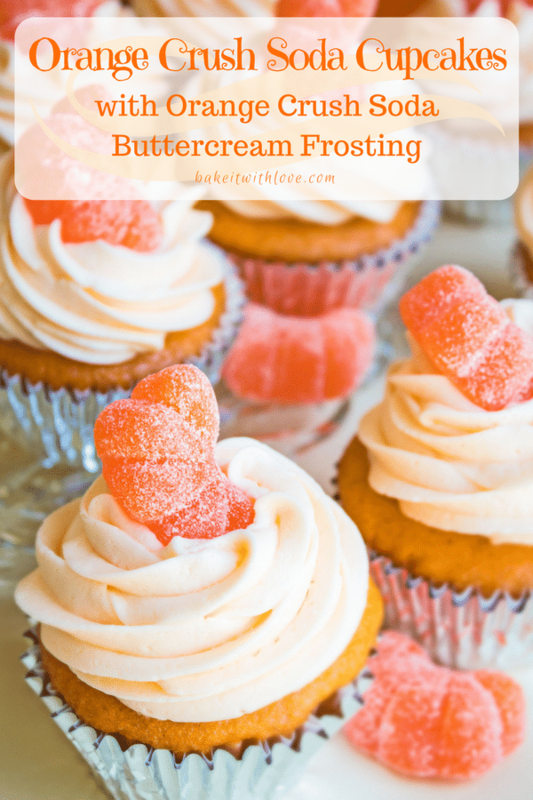 The classic soda flavor of Orange Crush Soda is used to make these super soft and moist cupcakes and their perfect topping, the equally delicious soda-infused buttercream frosting! Top it all of with a candy orange jelly slice and you have a cupcake that is packed with orange soda flavor, that also tastes a bit like a creamsicle! Completely orangalicious! While we have tried the whole rainbow pack of crush soda as cupcakes, we have repeatedly been told by all that the best flavored cupcake is the Orange Crush version. We agree wholeheartedly! Our runner-up in the soda based cupcake category is our Root Beer Cupcakes with Cream Soda Buttercream Frosting (you should try them too!). Fruity cupcakes are a perfect treat anytime of the year, but they just really hit the spot in summertime. 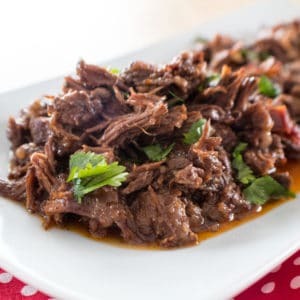 We love the fun color and flavor! Plus, our daughter Lauren usually can’t wait to offer to help out in the kitchen with such a bright and fun treat. That’s a big plus, we love getting her started cooking and we love spending time with her doing something that we enjoy so much! Whether or not you can use your kids as an excuse to make these up, bring home some Orange Crush soda from your next trip to the store and get ready to enjoy some amazing cupcakes! 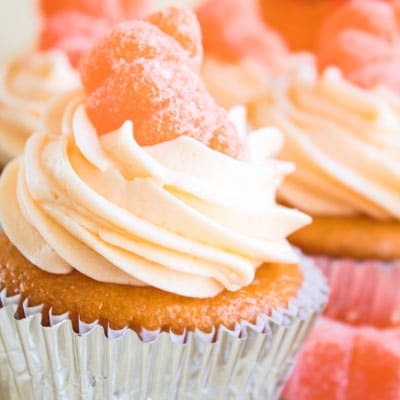 Orange Crush Soda meets Creamsicle in these delightfully soft and moist citrus cupcakes! Preheat your oven to 350 degrees F (175 degrees C) and line your cupcake pan with paper cupcake liners. Combine the dry ingredients in a medium mixing bowl: all-purpose flour, baking powder, baking soda, salt. In a large mixing bowl (or the bowl of your stand mixer) combine the sugar, eggs, and orange extract until smooth. Add the vegetable oil and mix until smooth again, then add the Orange Crush Soda. Mix the liquid part of the cake batter until well combined. Add orange food coloring (until you have a nice bright orange color, remembering that the color will dull a bit once baked) and orange jello. Mix until the color is even and your desired brightness. 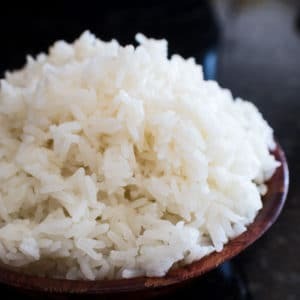 Add the dry ingredient mixture into your wet ingredients in 2-3 portions, mixing between each dry ingredient portion addition until all of the dry ingredients are incorporated into the batter. Add orange zest and mix into the batter. Pour batter into the prepared cupcake pan, filling each liner about 3/4 full. Bake cupcakes for 18-20 minutes, or until an inserted toothpick comes out clean. Remove from the oven and allow the cupcakes to cool in the pan for 5 minutes before removing to a wire cooling rack to cool completely. Beat butter (room temperature but not super softened) at medium speed for 2 minutes. Add orange extract, a drizzle of heavy whipping cream, and a portion of the confectioners sugar and mix to combine. Repeat alternating the liquids (heavy cream or the reduced Orange Crush Soda syrup) with the confectioners sugar until all of the confectioners sugar has been incorporated and you have a pipe-able frosting consistency. *You may not need all of the liquid, use small amounts of the liquid to keep your frosting smooth enough that your stand mixer or hand mixer can work through the frosting. If your frosting is too dry, it will bunch onto your mixer. If it is too wet, it will not hold onto a spoon well or spread and hold it's shape. **If you would like a stronger orange flavor, you can use more of the Orange Crush Syrup than the heavy cream. 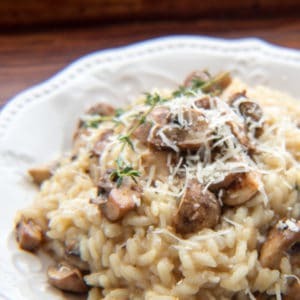 You can also omit the heavy cream completely. Pipe or spread the frosting onto your cooled cupcakes and top with the jelly orange slice (if desired). We used a Wilton 1M large star piping tip for our frosting swirls. how much sugar in the cupcakes? it is not on the ingredients list.. I missed a line, sorry! There’s 1 cup of sugar…thanks so much for the heads up! !